An agile workplace enables employees to work whenever and wherever work may happen, while ensuring that everyone can connect to resources and each other easily regardless of location. But it doesn’t stop there; an agile workplace considers the modes of work that take place, from collaborative work, that requires a space to support groups of people coming together with the right technology, to focused work that requires an environment that is comfortable and private and enables employees to become fully engaged in the task at hand. While this all sounds great in principle many business don’t fully appreciate the full benefits that an agile workspace can bring, and often have a misconception that in order to become more agile, a larger office space is needed or extensive refurbishment, but this isn’t the case. After salaries, it’s likely that the rent or mortgage on your building is one of your company’s largest overheads. So, why not make your space work harder? By making a few simple changes to your floor plans, you can ensure that each square foot of space is delivering a return on your investment. Firstly, think about the type of work your employees do each day, and the time that they are required to complete tasks sat at a desk. If you have a sales team or part time workers, it’s likely that at any given time several members of the team will be out of the office, on the road or meeting with customers. Additionally, not all daily tasks require employees to be sat at their desk. By opting for a nomadic workspace and installing a hot-desking solution you can free up space for additional work settings while giving employees choice and control. Steelcase’s B-Free range is a perfect solution if space if tight. The multipurpose furniture shown below enables employees to collaborate with one another while the added addition of privacy screens provide an area to escape if private or focus work is taking place. By providing a range of workspaces that are each designed with the type of work in mind employees are able to select the most appropriate workspace for the task at hand. If an employee is working on a time critical project that requires focus and concentration, sitting in an open office could either leave them feeling frustrated and unable to fully engage; or cause them to seek refuge in a local coffee shop or at home – removing them from the office. This situation was highlighted when Yahoo CEO Marissa Mayer infamously asked her staff to come “back to the office” in 2013, she understood the value of her team working collaboratively. If you provide employees with a range of workplace settings, they can easily transition from tasks without the need to leave their building, saving time, giving them the tools they need, and connecting them with their colleagues. By giving employees choice and control over where and when they work depending on their working requirements, it encourages a culture that is built on trust. Successful companies are realising that it’s not always easy to measure a workers productivity based on the hours spent sitting at a desk. Instead look at the quality of the work that is produced, the ideas that are generated and how engaged everyone is to work as part of a greater goal. When the term ‘Agile working’ is used, often there is common misconception that it simply means ‘working away from the office’ with a lot of employees working in isolation, with no real sense of belonging; but this simply isn’t the case. 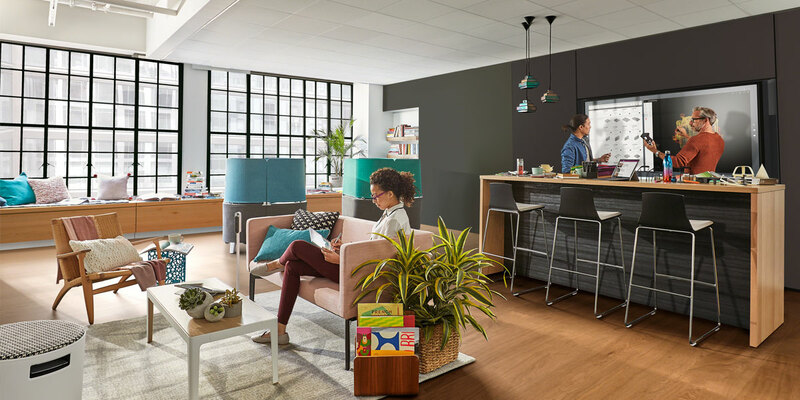 An agile working environment provides everything from collaborative and social spaces, to focused and rejuvenating spaces, bringing space, people and technology together so that they can do their best work. While implementing nomadic areas with hot desking solutions can be great for making the best use of your space, some employees can be reluctant to embrace change, and it can be difficult to break old habits. By re-educating department managers, they will be able to effectively communicate to their teams why the changes are happening and the positive impact it will bring not only to the workspace, but people processes and ultimately, productivity. At Penketh Group we can help you bring your people, processes and technology together. If you would like to discuss how we can help you make your business more agile, why not speak to one of our experts.